Cleans and revitalizes your wood! The special ingredients and oils in ORANGE GLO Wood Cleaner and Polish, remove built-up dirt and grime, taking off layers of old polish or wax, revealing the natural beauty of the wood. ORANGE GLO’s natural oils feed your wood the nutrients it needs, repelling moisture, watermarks and fingerprints. Also works well on Formica, vinyl, fiberglass and ceramic tile... tons of uses, you’ve gotta see it to believe it! Fresh orange scent! 32 oz. Spray Bottle. 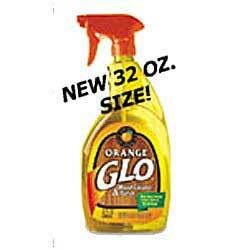 BOOKMARK THIS PAGE Orange Glo Polish 32 Oz.